The 10,000-square metre ICE AGE Kinderland might not be as big as a real ice-age glacier, but even so, this snow park, inspired by the film, features woolly mammoth, cave bear, saber-tooth tiger and many more. But all of this is not so much about film characters – it is about the animals that used to live in Tannheim Valley a very long time ago. 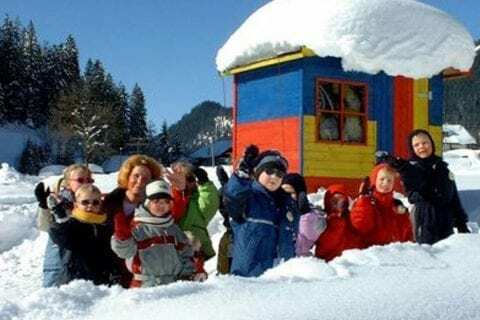 Just outside our door, in the ski resort Schattwald-Zöblen, your children will discover a magical winter wonderland on the ‘snow pixie-Pumuckl slope’. Baby slopes are a thing of the past. An exciting course and a ski carousel make the Pumuckl slope a unique experience. In Grän, the tiniest toddlers can romp to their heart’s delight on a gentle slope. There is also a wave run and a slide for small kids to familiarise themselves with snow. The slope features well-known fairy-tale figures like Mother Holle or Snow White. 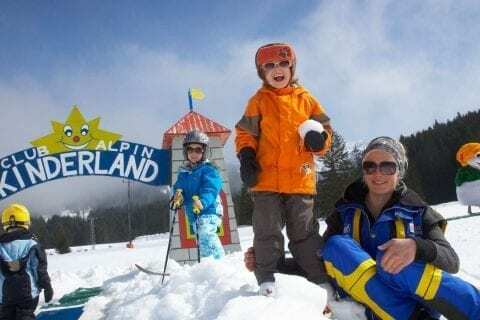 The instructors at the ski and cross-country ski schools in Tannheim Valley base their teaching methods on the official Austrian skiing curriculum, and offer courses for children aged 3 and above. 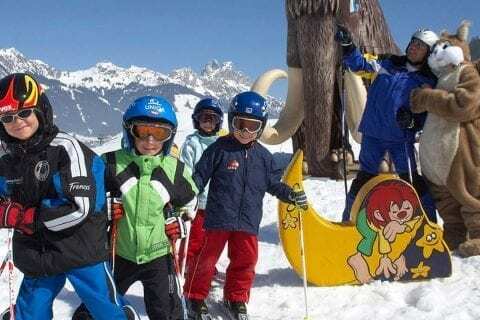 They also offer features such as childcare during lunchtimes and full-day care, individual and group lessons, private skiing instructors, torch runs, final races with award ceremonies and prizes. The seven ski schools in Tannheim Valley also offer courses in Alpine, cross-country skiing and snowboarding for beginners to advanced learners of all ages. Ice-skating on frozen Lake Haldensee. People of all ages who enjoy performing pirouettes and skating figure eights are recommended to make a trip to Lake Haldensee, where they can glide on a glistening, frozen lake. Frozen ice and the snowy mountain scenery will make for a sparkling fairy-tale day. If you want to do something more sportive, go to the Tauschers Alm, above Lake Haldensee, where you can try your luck at curling. Kids and teens will love it! Nothing is more thrilling and exciting on a winter’s day than sledding down a hill. 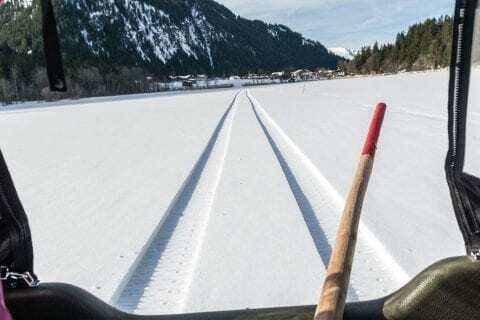 The Tannheim Valley has two superb toboggan runs in Haldensee. And there are some great runs in Allgäu and Oberjoch too. Enjoy the variety of our toboggan runs, the quaint places you can stop at for meals or refreshments and the stunning landscape. Your children will love the feeling of whizzing down the slopes into the valley. 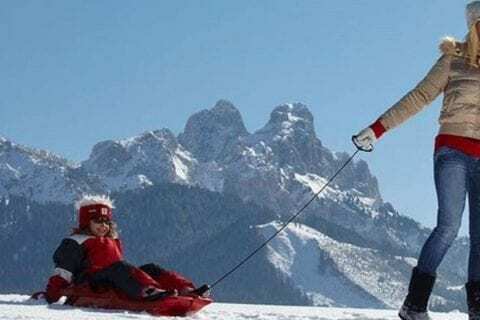 Why not start your sledge ride at Adlerhorst (the ‘eagle’s nest’) and sled all the way down towards the valley.One of the most beautiful and spectacular vantage points in the valley is also open in winter. Uphill by foot and downhill by sledding along a gently winding toboggan run. Sensational fun! Nesselwängle Kids’ Land has a rope tow, a wave run, a bobsleigh run and a fairy-tale hut including fairy-tale characters. The tow rope is a bit like playing a game of tug of war in ‘Kids’ Land’ in Nesselwängle. Skiing is great on the wave run and if you feel like doing something else, you can always try out the bobsleigh run. Fun is guaranteed.